After the rise of Asia in the 21st century, Western liberalism and representative democracy now face a challenge, and Taiwan encounters both difficulties as well as opportunities in the drastically changed global political-economic situation. 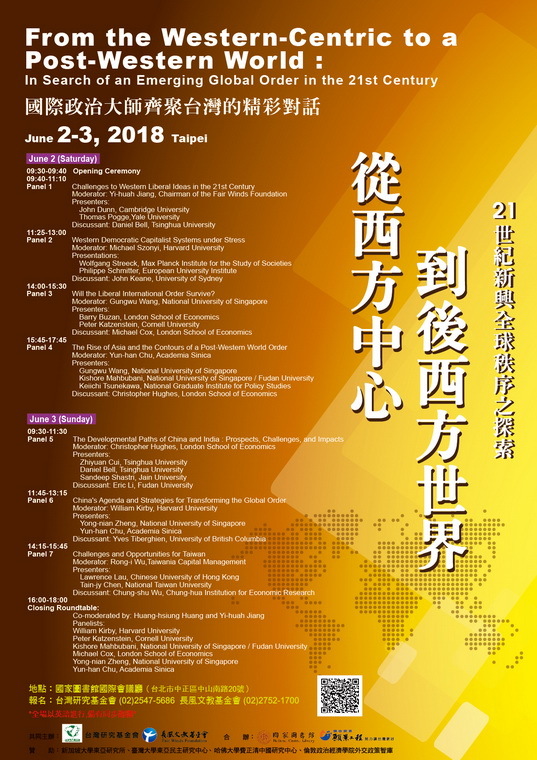 In order to delve deeper into these issues, the Taiwan Research Foundation and the Fair Winds Foundation co-organize on 2 and 3 June 2018 an international conference titled, "From the Western-Centric to a Post-Western World: In Search of an Emerging Global Order in the 21st Century". From all over the world, we have invited the top scholars on this subject to come to Taiwan and engage in an intense dialogue that will bring out knowledge of the highest level.